Astro Torah: Yam Suf 7 or 8 Days from the Exodus? 1. Not sure I understand your logic. Do you imply that klal yisrael at the time counted like the Egyptians and it was the 7th day for them? Now that our system has changed we count 7 days according to our own system? 2. Also, can you please post the exact dates and coordinates to recreate these phenomena in Stellarium? 3. Do you use the traditional Seder Olam chronology in your calculations? 4. The malevolent sign in Aquarius helps to better understand the midrashim klal yisrael being in a state of judgement at the time. 1. I am not sure whether Klal Yisrael followed this system or whether Rashi was referring to how the Mitzrim viewed the events. The Meiri does state that our korbon was done at midday because it was considered to be the beginning of the day. 3. I wish I had enough time to discuss this point in depth, in my upcoming book I have an appendix that is the size of a regular chapter that talks about it. Basically, I use the regular chronology of Seder Olam, but I utilize Rebbi Yehoshua's opinion that the world was created in Nisan. (R"H 11) That means that 2,448 years after Creation is the Exodus, but since the calendar changes at Rosh Hashana (in our current system) and the Exodus occurs in Nisan one has to change the secular calendar one extra year (between Rosh Hashana and Nisan you inevitably passed through a January 1). Also, you have to factor in that the secular calendar has no year 0, nor does the Hebrew calendar. Also, there was a year called Shnas Tohu that is year 1 (discussed in the Tur in Hilchos ROsh Chodesh) in our calendar making Creation in year 2. I hope that this helped make things clear and did not make things worse. Unfortunately, with posts I often write them on the quicker side and, unlike the book, don't have an editor. After posting this, I realized that my theory may actually have roots in something else that Rabbeinu Bachye says, Baruch Shekivanti Rabbeinu Bachye mentions that the Jewish nation should have perished at the Yam Suf because the Egyptians had tapped into the inlfuence of Mars which is associated with death. It was only because of God's tremendous mercy that he saved us. (Rabbeinu Bachye Shemos 14:25)I felt that this adds an integral element to that portion of the post, so I included in the actual post in addition to this comment. Thank you. Thanks for the interest, perhaps, I can help with your questions. The moon does come close to Mars on a monthly basis, BUT DOES NOT TOUCH IT. The more precise term would have been an occultation and not a conjunction, but I felt that the average person would feel more comfortable with the first term which does, as you state, also connote a closeness when not touching. Therefore, let me be more accurate and state that I am referring to an occultation in the post. 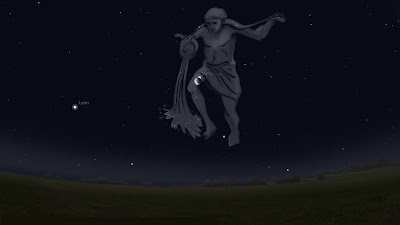 Occultations are not common and WHEN TAKING INTO ACCOUNT THAT THE OBSERVER HAS TO BE AT A LOCATION WHERE IT IS NIGHT TIME, THEY ARE VERY RARE. It is comparable to the moon and sun. Both come very close once a month, a conjunction, but they do not touch as often, an eclipse (although the sun and moon experience "occultations" or eclipses far more often than the other planets, due to size and orbit. In fact, they eclipse several tiems a year, but try and remember how often you see an eclipse). They eclipse on a much rarer basis when one takes into account the location of the observer. Do you have the name of the book/author of that set of books? I would be interested in seeing it. I undersrand it seems it is hard for you to type, can you just mention the name of the book/author? I searched around a bit and found something about planetary cycles and comparing that to the number of verses, is that what you are referring?